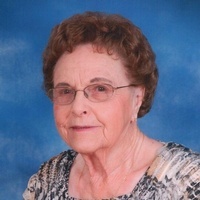 Jeanette “Jean” Gully Hoelscher, 86, of Rowena passed away Tuesday, March 26, 2019 at Shannon Medical Center. She was born August 6, 1932 to Gus and Bernadine (Halfmann) Gully in Rowena. After graduating from St. Joseph High School in Rowena, Jean married Ray Gene Hoelscher on September 8, 1951. They shared 51 years together before his passing on August 26, 2002. Jean worked as a telephone switch operator, worked at the County Clerk’s office and finally at the US Postal Service. She cared for several family members, as well as, being a homemaker to her husband and seven children. She was a member of the Catholic Daughters, St. Ann Altar Society, VFW Auxiliary, and volunteered for Meals On Wheels. She was an active member of St. Joseph Catholic Church. Jean loved her family and especially enjoyed the family gatherings at Brady Lake. Jean is preceded in death by her husband, Ray Gene; her daughter, Janel Vaughn; her parents; brothers, Arthur, BJ, and Hillary Gully; and sisters, Lillie Ann Biedermann and Mary Fry. She is survived by her children, Gary Hoelscher and wife, Lynette of Miles; Cindy McMillan and husband, Kent of Garden City; Kay Halfmann and husband, Ronnie of Austin; John Hoelscher and wife, Karen of San Angelo; Steve Hoelscher and wife, Mary Lee of Wall; Chris Hoelscher and wife, Kelliann, of Southlake and son-in-law, James Vaughn, of Bronte; seventeen grandchildren; twenty-nine great-grandchildren; and one great-great-grandchild. Rosary will be recited at 6:00 pm on Friday at St. Joseph Catholic Church in Rowena. Mass of Christian Burial will be at 10:00 am on Saturday at St. Joseph Catholic Church. Burial will follow at St. Joseph Catholic Cemetery.